Hello Springtime! Lovely flowers, buzzing bees, flying butterflies, and colors galore. And hello sniffling noses and pestering allergies. 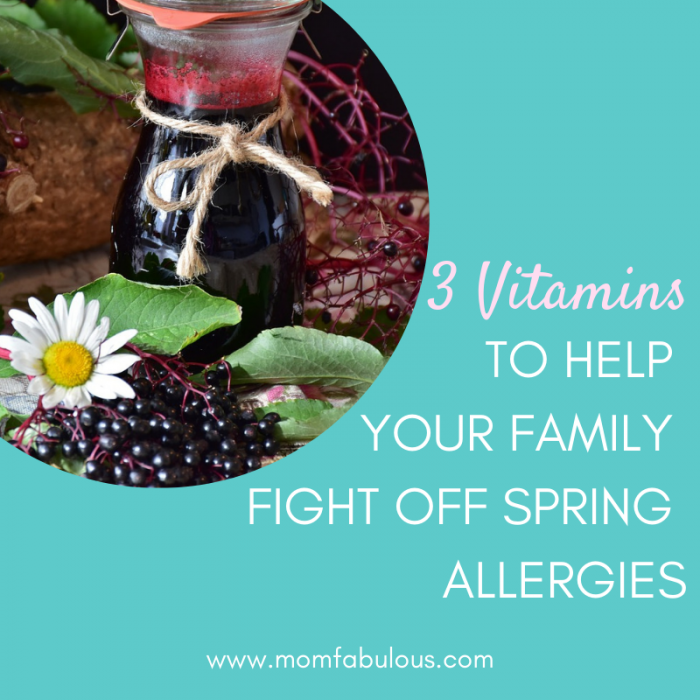 How can you fight those Springtime allergies? With these all natural remedies! Sneak these into your daily routine and you’ll be one step ahead of fighting colds and flus. Plus, these natural vitamins come in tasty forms that even your kids will enjoy. Elderberries have become a buzzword in the health community over the last few years. In fact, some health food providers have had trouble keeping elderberry products stocked on their shelves during cold season! But this isn’t a new remedy. The extract from elderberries has been an herbal concoction to repel colds, sinus infections and the flu for centuries. Some historians even note that ancient Egyptians used it to heal burns or improve their skin. Here’s our recommended Elderberry product! Research has shown its potential to ward off viruses or lessen inflammation. One study revealed that taking elderberry extract before extensive travel (like an intercontinental flight) reduced the duration of the cold and its severity. Elderberry extract has been suggested as a “safer alternative to prescription drugs for routine cases of the common cold and influenza,” especially for upper respiratory symptoms due to viral infections. Elderberry juice and extract can be beneficial before, during, and after having the flu. Extracts from Canadian elderberries can inhibit cell proliferation of brain tumors. Taking black elderberry extract has been shown to improve “good” HDL cholesterol levels. MomFabulous recommends taking a daily dose of elderberry extract during cold or allergy season. Be sure to find a elderberry extract from a reputable organic source and a product without added ingredients. You’ve probably heard of this vitamin before, especially related to allergies or colds. The human body doesn’t produce vitamin C, even though it essential to our overall health. When there is a lack of this in your system, scurvy sets in. This was a common disease impacting the poor Americans in the 1920s; this incident prompted the U.S. food industry to add supplemental vitamins, including vitamin C, to many store-bought products. Next time you pick up bread, milk, or cheese, read the label to find vitamin C.
Here’s our recommended Vitamin C supplement! This antioxidant nutrient boosts our immune system by fighting off free radicals (which lead to cancers or diseases). Maintaining healthy vitamin C levels helps you age well and fight off those seasonal illnesses. Take this before, during, and after you fight off Springtime colds. Vitamin C plays a major role in the average cold. Taking vitamin C halved the amount of common colds in people who are physically active. Regular consumption of vitamin C shortens the length of colds. This vitamin can even prevent pneumonia or treat tetanus. Vitamin C increases the functioning of immune system cells. Adults should consume 75-90 mg of vitamin C daily, which naturally occurs in bell peppers, oranges, grapefruit, kiwi, broccoli, strawberries, cantaloupe, spinach and peas. You can also take a supplement in pill, powder, or gummy form. As always, read the label; avoid added sugars or unnecessary ingredients, and purchase from a reputable company with sustainable origins. Vitamin D, also known as the sunshine vitamin, is most readily absorbed into your body via the sun on your skin. Without proper vitamin D, your immune system in inhibited, thus a cold is more likely to occur. Although the sun begins to shine during Spring allergy season, you may be prevented from spending enough time outdoors (not to mention you may or may not have been cooped inside all winter long). You can absorb enough vitamin D from certain foods such cod liver oil, salmon, tuna, egg yolks, or foods fortified with vitamins (including most cereals, dairy products, and breakfast juices). Supplements for vitamin D are commonplace in the modern world, where most people spend their days indoors instead of outside. Many gel capsules or gummies are available for purchase, and most doctors recommend a daily supplement of vitamin D if you don’t spend regular time in nature. Here’s our recommended Vitamin D Supplement! 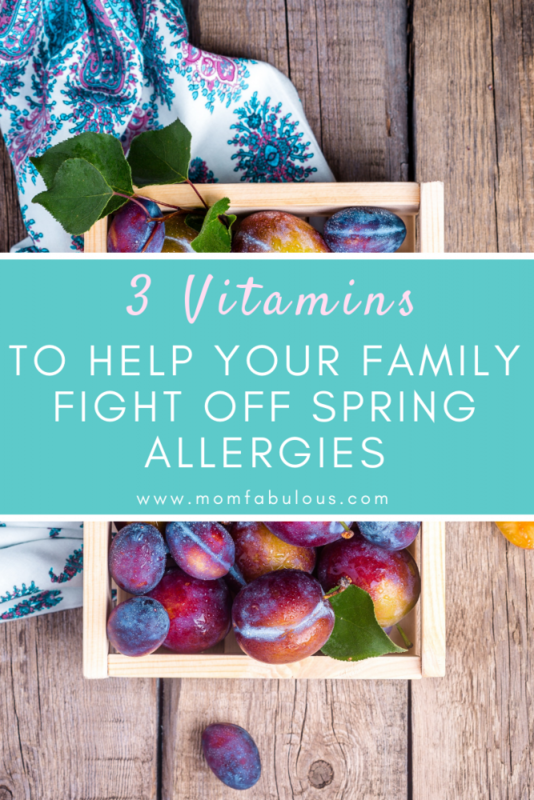 Head to your local grocery store or shop online and pick up these vitamins to boost your family’s immune systems against those Springtime allergies or the common cold.